With the success of Oregon football this season, it’s easy to get caught up in the excitement and fail to notice some of the life lessons that abounded this past week in college football. The vaunted SEC West, for example, once again proved the value of being a big frog in a small pond. Mississippi State and Ole Miss took down I-AA not-so-powerhouses Tennessee Martin (5-6) and the Presbyterian Blue Hose (5-5), respectively, proving once again the SEC’s ability to dominate Conference USA, the Sun Belt and Division I-AA. The life lesson? Find something you’re good at and stick with it? Maybe that works for them, but we can do better than that. Life lessons from the past week of college football are the subject of this week’s Three-and-Out. ESPN counts a half dozen chickens into the wrong column. 1. Don’t count your chickens before they’re hatched. Utah’s Kaelin Clay preened for the crowd. The Utah Band struck up “I Am a Utah Man Fan.” The fans exchanged high fives, jumped up and down – smiles, hugs and chortles around. ESPN ran the score to Utah 13, Oregon 0, as its perplexed announcer asked, “What is going on on the field here? … Wait a minute.” By now we all know that Clay left something behind before he crossed the goal line, namely that critical element called “the football.” This doesn’t just drive home the importance to all of us of “not dropping the ball” in whatever it is we’re doing. As expressed by the ESPN announcer, who didn’t have a clue, there’s also the issue of being aware of what’s going on. 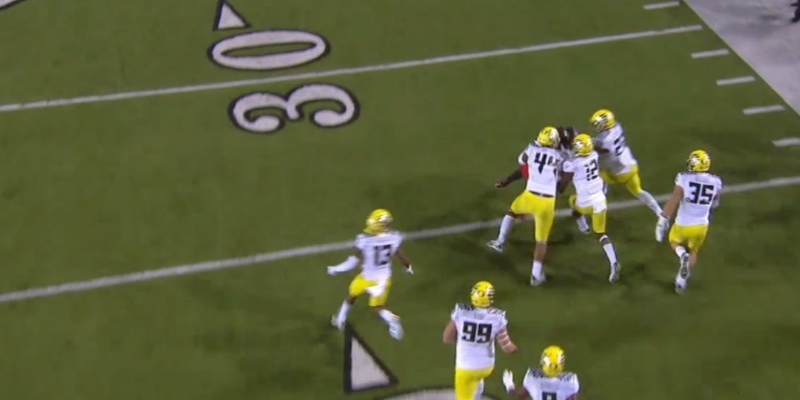 As Walker scooped up the ball and took it 100 yards the other direction, he had over half the Oregon players on the field out in front blocking for him – because the Ducks were paying attention to what was going on. Joining the clueless ESPN announcer, Utah had only one player who had the presence of mind to try to stop Walker. One tackler trying to get through six blockers to tackle a 6’2, 250 pound stampeding linebacker with the ball (top photo) … uh, no, not happening. 2. Win the Day. It’s the Oregon mantra. It’s the philosophy professed by Eckhart Tolle in The Power of Now: A Guide to Spiritual Enlightenment. It’s the corner back who got beaten on the last play putting it behind him. It’s Chip Kelly saying (more or less), “We don’t worry about that, because there’s nothing we can do about it. We only worry about things we can do something about.” It’s forgiving the past, getting on with life, not worrying about the future and using the present moment – which is the only thing we really have any control over – to its full potential. Read the comments on most any article about the 2014 Oregon Ducks, and you will see that many fans fail to take advantage of this mantra, even in their approaches to fandom, lamenting the dropped balls, sacks, defensive schemes and referee calls, worrying about Stanford, worrying about Utah, worrying about the chances for a playoff bid. So if they’re living with all this negativity in their roles as fans, how are they approaching the rest of their lives? This “Win the Day” thing isn’t just for the football team. It’s something we can all take with us. 3. Where There’s Smoke, There’s a Winston. No, this isn’t a cigarette ad. It hardly seems that a week can go by without Florida State’s Jameis Winston making off-field news in a bad way. This week Winston’s attorney is seeking a delay in his student conduct hearing for sexual assault — AND eyebrows have been raised over the possibility that Winston shaved points to “lose” first half spreads. No doubt Winston would like to see the hearing delayed until after football season. But of course the smart money says that once football season is over he will no longer be a student, so the hearing would never happen. And the fact that he has a friend who bet $5500 on FSU not covering the spread in the first half of a game in which he threw two first half interceptions doesn’t prove a thing. But there’s a lot of smoke. Again, let’s take advantage of the lesson and apply it to our personal lives. Sometimes there’s smoke without fire, but too often we see the smoke, and, good-natured people that we are, we ignore the possibility that there’s a fire, instead believing what we hope to be true rather than heeding the warning signs. Oregon football has a great season going. They are truly Big Ducks in a Big Pond. Beyond that, though, the Ducks are inspirational, not only in the success of their outcomes, but in their approach as well. They are aware. They live in the now. They don’t tolerate smoke. Their approach to football is something worth emulating in our personal lives. 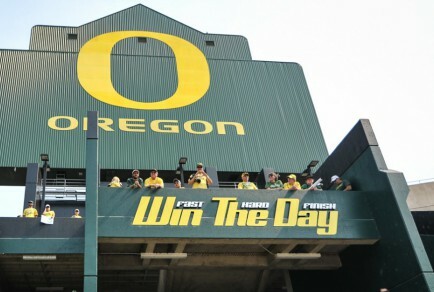 Go Ducks, and Go You!